How was your day yesterday or the day before that? Do you remember what happened; how you felt, who you spent time with, what you saw, heard, tasted, or experienced? Do you remembered what moved you to tears or laughter? It wasn’t long ago that I didn’t remember any of those things unless I looked at my calendar or my to-do list. Every day felt like a race against the clock and a quest to see how much I could cram in and get through. After a while though, I realized I wanted more than to just get through my life. I wanted to show up for it, to be in my life and not just checking pieces of it off my list each day. If you’d like to show up for your life too, this is what I recommend. These are things I’ve done that have made the biggest difference and allowed me to be fully present for what matters to me. These aren’t listed in order of importance. This isn’t a competition or a race and these are all practices I continue to revisit and refine. Experiment, be curious, be gentle with yourself and remember you aren’t doing this to have a simple life, you are doing it to have a life – a life you want to show up for and experience with your whole heart. 1. Make a little space. When everything is important, nothing is. Start to show up for your life by making room for it. 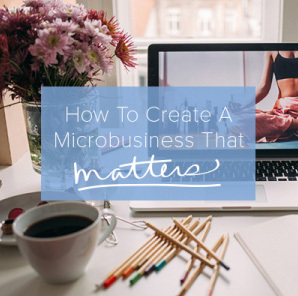 Make a little space by clearing some distractions from your living space, your working space, and from your calendar. This doesn’t mean you have to get rid of everything right way. Even 5% less will make a difference. 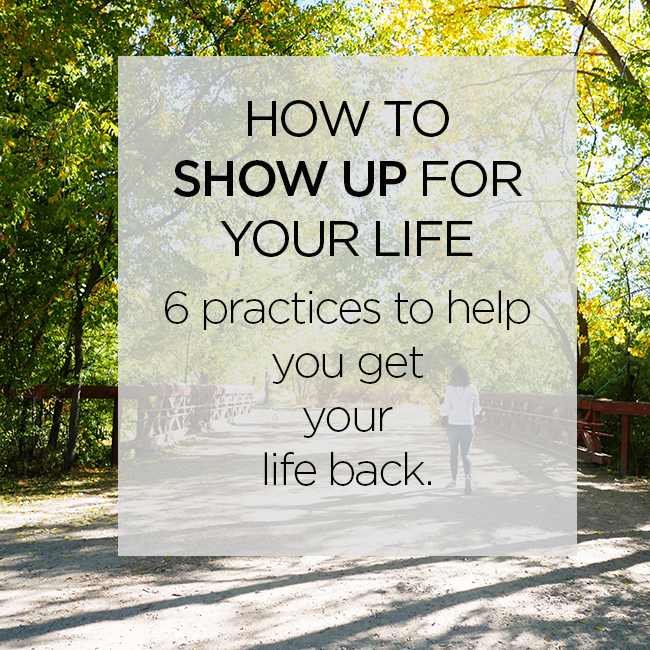 It’s hard to show up for your life when you are tired, lack clarity or don’t feel well. This almost always comes back to food. What you eat has a direct impact on how you feel and how you experience your life. I don’t want to recommend a specific diet, but instead recommend that you learn what foods make you feel the best (and the worst). Try a nutritional reset like the Whole 30, eliminating common trigger foods like sugar, dairy, grains, alcohol and others. Notice how you feel when you add them back to your diet. You might also try keeping a food diary including how you feel each day. Look back after 30 days and see if you notice any patterns. When you are mostly eating food that is best for your body, you will sleep better, have more consistent energy throughout the day and feel more alive. 3. Put your phone down. Our digital devices add value to our lives but they also steal us from our lives if we let them. When you put your phone down, you can notice your surroundings, listen to your heart, and make eye contact. You can pay attention to what is right in front of you. Without the distraction of our digital devices we are less scattered and more focused. There are plenty of things we can do to manage digital usage like turning off notifications or switching on airplane mode but the only way to show all the way up for the life right in front of us is to put the phone down. Deciding what to wear requires mental energy better spent on other things. Clean out your closet for good, create a uniform, or try minimalist fashion challenge Project 333. 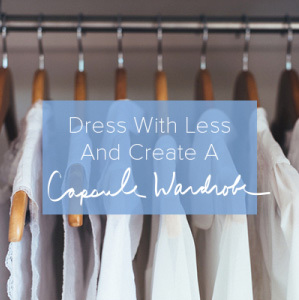 By choosing what to wear from a small capsule wardrobe, you’ll get to wear your favorite things everyday and eliminate decision fatigue. Save your brain power for more meaningful decisions, creative ideas and problem solving throughout the day. Sometimes my morning routine is hours of writing, walking, yoga, and meditation. When I travel or have an early morning meeting, my morning routine is a shorter version of writing and meditation or just walking. Consistency is more important than intensity when creating a morning routine that fuels your day and helps you show up for your life. Here are 10 teeny tiny things you can do to start your morning routine. When you are overwhelmed, tired or stressed … the solution is less. Get rid of something on your calendar, something on your to-do list, something on your mind, and something on your heart. Let go of the idea that you have to get it all done or who you are is somehow measured by what you cross off your to-do list. You are so much more than that. 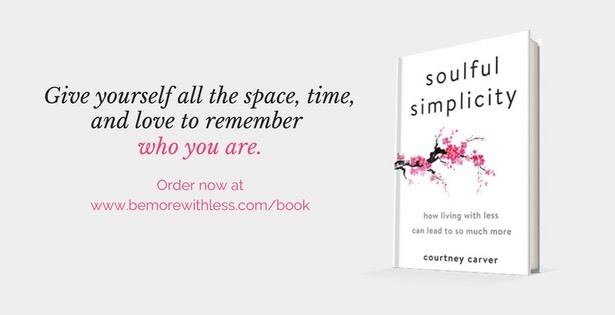 Simplicity is the way back to love because it gives us the time, space and presence we desire to show all the way up for our beautiful, messy, magnificent lives. Thank you for these suggestions. I think number 3, putting your phone down, is especially good in the evening. I find that I get to sleep easier when I’m not all wound up by e-media. Or maybe it’s the blue light thing, but either way I get to sleep easier! I just found out that I’m not supposed to eat gluten, and I’m curious what a difference it’ll make once I cut it out of my diet. Thanks for the tips! Love these Courtney! I’ve just started the Whole30 after several months of mindless eating. Working bit by bit at number 3 and number 5. Morning routine is soooo key to setting up your day! Well, I can admit I have the morning routine down-and make no retirement plans before eleven except for one day a week! Doing less is my thing for the coming year! Ever since this summer when I attended you Dress with Less course in Victoria I’ve been excited about your upcoming book. I am doubly excited now as my local library has it on order, they have ordered 5 copies and there is already 5 requests on it. I would love to have bought it myself but this way so many more people get to read it. I would say that is a Win, Win situation. I am so tempted to whittle down my wardrobe to 33 pieces. After reading this post, I’m going to take the plunge. I waste so much time and energy looking at, caring for and storing clothes. It’s crazy. I agree with other comments that morning routines are key. They set the tone for the entire day. Amen and amen! Courtney, thank you for putting into words how so many of us feel. Thank you for the six hints of helping ourselves be present in our lives – not just making it through to the next weekend, holiday, or vacation. That’s no way to spend out one precious life on this earth. I’ve put into practice some of these – eating better food (lost 40 pounds), dressing with less (participated in your Project 333 a few years ago & it changed my life), and putting down my phone. I am just now making some space; after space is made, I may try a few of your ideas about making a routine – though I will listen to myself for cues of what fuels me. Thanks for opening up your life & showing us your vulnerability – you often write what we need to hear & you gently remind us that we don’t need permission to slow down & value ourselves & our lives. You are saying what we should already know but don’t acknowledge because of our culture is screaming the opposite message. Thanks again!